Oddly enough, most Canadian graduate students interested in working in the space systems industry are likely going to end up working in either Europe or the United States for a few years until they've built up enough experience for Canadian organizations to be interested. The Canadian Space Agency (CSA) Career Page - Interesting background on CSA hiring policies and procedures. R4Space site - British based site focused on engineering careers for the growing aerospace defense security and space systems industry. Space Careers - French based, English language site focused on "the top jobs and the best talents in the industry." 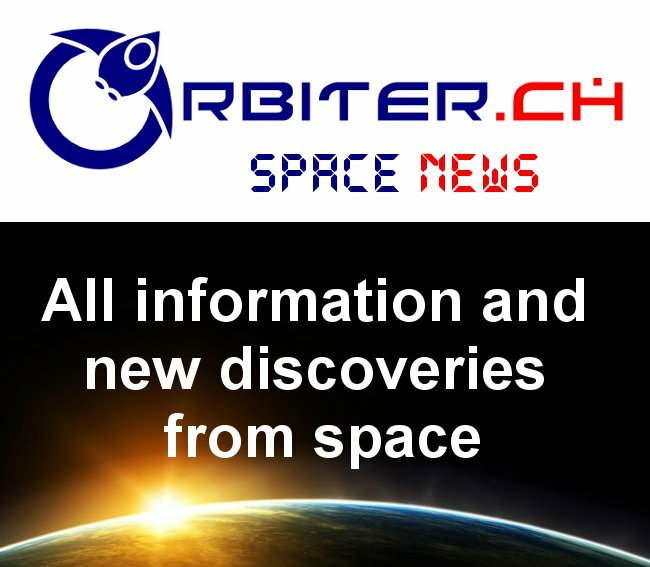 Contains a jobs center (where job hunters and recruiters register), a space industry directory and a news and resource section with space news RSS feeds. The Space Job Center - Czech Republic based employment service focused on the space industry founded in 2010 by "a group of professionals from different industries that transitioned to the space sector." Site is currently free but this notice indicates that the site owners will begin charging users once a "certain level" of daily traffic is reached. The Space Exploration Technologies (SpaceX) open positions page - The company that built the worlds first commercial spacecraft has dozens of job openings requiring a wide range of expertise. It's also worth noting that the Canadian Auto Workers, Canada's largest private sector union, represents aerospace employees at Boeing Canada (Local 2169), Bombardier/ de Havilland (Local 112), Cascade Aerospace (Local 114), CMC Electronics, Magellan Aerospace/ Bristol (Local 3005) and Pratt and Whitney Canada (Local 510). Worth contacting to learn a little more about the range of opportunities available. 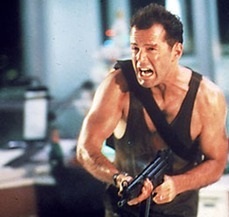 Bruce Willis in Die Hard. 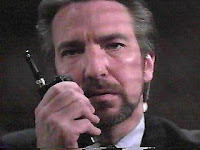 Much like Bruce Willis in the 1988 movie Die Hard, the Federal government seems to have responded to an escalating series of public comments from BC based RADARSAT Constellation (RCM) prime contractor MacDonald Dettwiler (MDA), with an indirect suggestion that actions speak louder than worlds. The federal government is raising the monetary threshold for a review of a foreign takeover of a Canadian company to $1 billion from $330 million over a four-year period. Ottawa is also creating a formal mediation process under the Investment Canada Act that will offer a voluntary means of resolving disputes when the minister believes a foreign buyer has failed to live up to its obligations. But the government statement came only days after the May 22nd, 2012 Wall Street Journal article "Uncertainty Over MDA Project Highlights Risks With Canada's Foreign-Investment Laws" which focused on the "risks national governments take when they signal to foreigners that certain sectors are off limits to investment." 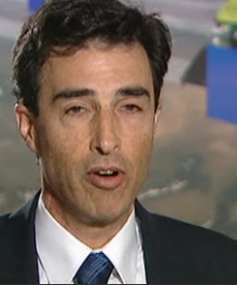 The Wall Street Journal article also quotes MDA CEO Dan Friedmann as stating that, while he agreed with the government decision to block the proposed 2008 sale of the space technology division of MDA to US based Alliant Techsystems (ATK), his company is "now poised to lay off workers if it doesn't come to terms with the government over funding." So the timing of the government update of the foreign investment regulations is likely not entirely coincidental. As outlined in the April 10th, 2008 CBC News article "Federal government blocks sale of MDA space division," the proposed $1.3 billion CDN sale of MDA to ATK was blocked by the Federal government in 2008 over Canadian concerns relating to national sovereignty, ongoing access to sensitive RADARSAT1 and RADARSAT2 data plus issues relating to the viability of the follow-on RCM program. 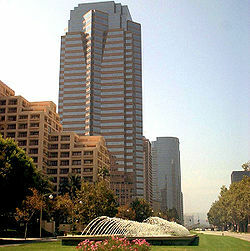 Fox Plaza in CA, which served as the fictional Nakatomi Plaza in the movie Die Hard, but looks nothing like MDA headquarters in BC or the John H. Chapman Space Centre in PQ. While the current valuation of the MDA space technology assets is likely still over the $1 billion dollar "monetary threshold" required for review under the proposed regulations, the Federal government seems to have no objection to MDA selling off assets piecemeal. For example, the December 2010 sale of the MDA property information business to TPG Capital for $850 million CDN, as described in my November 6th, 2010 post "Happy 15th RADARSAT..." received essentially no government scrutiny and generally passed unnoticed in Canada. So these new rules seem to have provided MDA with a second option to remain profitable in the absence of additional government funding for RCM by selling off sections of the company or developing new business lines. But the Federal government has also (whether accidentally or not) suggested to MDA that "actions speak louder than words" by refusing to address the RCM issue directly or provide any additional funding for the program. In other words, "Yippee Ki Yay" MDA. As outlined in my May 14th, 2012 post "MDA & RADARSAT Constellation's War of the Words" the latest public statements are only the most recent in a series of escalating comments over RCM funding. Recently released Department of National Defense (DND) documents indicate that RCM, originally estimated at $600 million CDN, is now likely to cost over $1 billion CDN to complete. The Space Exploration Technologies (SpaceX) Dragon space capsule, launched into Earth orbit by a SpaceX Falcon 9 rocket at 3:44AM EST this morning from Launch Complex 40 at the Cape Canaveral Air Force Station in Cape Canaveral, FL, is expected to dock with the International Space Station (ISS) later on this week. The spacecraft manifest includes 674 pounds of ISS supplies and crew provisions, various commemorative patches and pins expected to increase in value as a result of their trip, a collection of student science experiments and the remains of Mercury astronaut Gordon Cooper, Star Trek actor James Doohan and 306 other people, at least according to the May 22nd, 2012 ABC News article "Celebrities' Ashes Launched on SpaceX Falcon Rocket." Today's launch is the latest under the Commercial Orbital Transportation Services (COTS) program to design, demonstrate and develop a system to resupply cargo to the ISS. In 2010, as part of the COTS Demo Flight 1 mission, SpaceX became the first privately funded company to successfully launch, orbit and recover a spacecraft. The company also expects to develop a human-rated Dragon capsule as part of its Commercial Crew Development (CCDev) program to transport crew to the ISS. ISRU Info: The Home of the Space Resources Roundtable - These are presentations from an annual conference promoting the development of space resources under a model most often advocated by companies like asteroid mining firm Planetary Resources. Recent meetings have been held in conjunction with the Planetary & Terrestrial Mining Sciences Symposium (PTMSS), which bills itself as "the future of space mining." LEO on the Cheap - By Lt. Col. John R. London III. A fascinating read about methods to achieve drastic reductions in launch costs. It's part of the Dunn Engineering website and serves as a useful companion piece to the 1993 John Walker article "a Rocket a Day Keeps the High Costs Away." The Microsat Way in Canada – A paper written by Peter Stibrany and Kieran A. Carroll discussing how micro-satellite manufacturing methodologies will change the economics of space applications and reduce the barriers to entry for new companies. 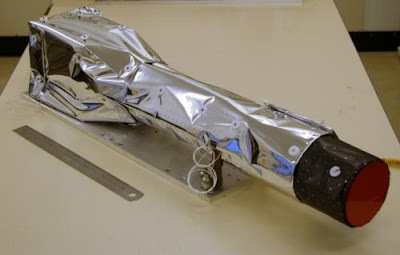 This is the basis for the techniques used today at the University of Toronto Institute for Aerospace Studies (UTIAS) Space Flight Laboratory (SFL). The Orbital Express Project of Bristol Aerospace and Microsat Launch Systems - An important Canadian case study for those wishing to study the technology and business development issues surrounding a small satellite launch vehicle. A Short History of Private Space Development - Useful historical context from Clark S. Lindsey, who writes, curates and edits the HobbySpace.com website. Of course, once the heavy reading is complete, it's always worthwhile to kick back with a short promotional video on one of the more interesting "high concept" near future space focused movies to come down the pipeline over the last few years. Unfortunately, this movie is not currently scheduled for release in Canada anytime soon. Anyone who'd like to change that is encouraged to link to the official Iron Sky website. Its likely a good thing that the April 24th, 2012 press release from the Aerospace Industries Association of Canada (AIAC) titled "Aerospace Review Nears Two-Month Mark of Study," is written specifically to imply that the procedures surrounding the submission of recommendations to the Aerospace Review are well organized, well defined and will lead to a series of verifiable and achievable end-goals. This should help each one of us to sleep deeply and securely with the knowledge that experts, under the seasoned leadership of ex-MP David Emerson, are currently dealing with the hard questions surrounding our space systems industry in an organized and effective manner. Unfortunately, given that the end goal of the review is to encourage "innovation" and "competitiveness" across an industry with thousands of organizations and tens of thousands of workers competing for billions of dollars in national and international sales normally requiring substantial government financial and political support, it's also useful to note that true innovation is always a messy series of unorganized collisions between contrasting ideas and competing interests. As an example, here's an interesting visual presentation of the concept from Steven Johnson, who's spent the last five years figuring out "where good ideas come from" and has even written a best selling book on the topic. 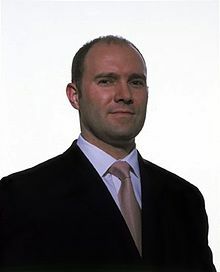 Johnson's thesis is that connections, community interactivity and the free and open sharing of ideas are the real keys to business innovation and increased competitiveness. Johnson has also presented his thesis at a recent TED conference, where he expanded on how the slow development of "hunches" gives rise to real innovation and provided an interesting example of how one specific hunch, related to tracking the very first Sputnik satellite in 1957, eventually led to the creation of the current global positioning network of satellites. And Johnson isn't the only person who believes this. Kirby Ferguson, a New York-based filmmaker, goes even further. According to Ferguson, "copying" is the real key to "transformation," creativity and innovation. In essence, according to Ferguson, pretty much "everything is a remix." The Aerospace Review, announced on February 27th by the Government of Canada "to produce concrete, fiscally-neutral recommendations on how federal policies and programs can help maximize the competitiveness of Canada's aerospace and space sectors," will wind up public submissions on June 30th. After that, there will be six months of internal discussions before the final report is expected to be presented to the Industry Minister in December 2012. Then the real public debate begins. That's when we start accepting, assessing, rejecting and ripping apart the sorted series of recommendations from the Emerson panel, and begin to turn them into the messy series of unorganized collisions between contrasting ideas and competing interests needed in order to encourage true innovation. Whatever Happened to the Canadian Space Challenges? Back in 2009, a retired mining executive named John Chapman, sent a letter to Canadian Space Agency (CSA) president Steve MacLean suggesting the creation of a series of national contests and prizes similar to the NASA Centennial Challenges program in order to accelerate Canadian space related technology development. 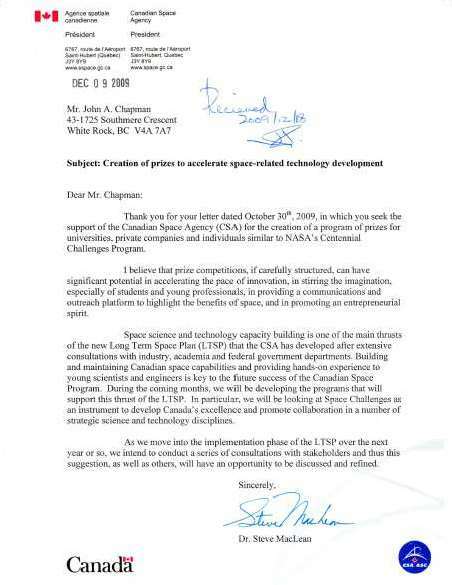 As outlined in the December 9th, 2009 SpaceRef.ca article "Canadian Space Agency Supports Prize Competitions," Chapman even received a reply from the then new CSA president, who agreed with the suggestions and indicated that "over the coming months," the CSA will be looking at a series of "space challenges" as an "instrument to help develop Canada's excellence and promote collaboration in a number of strategic science and technology disciplines." 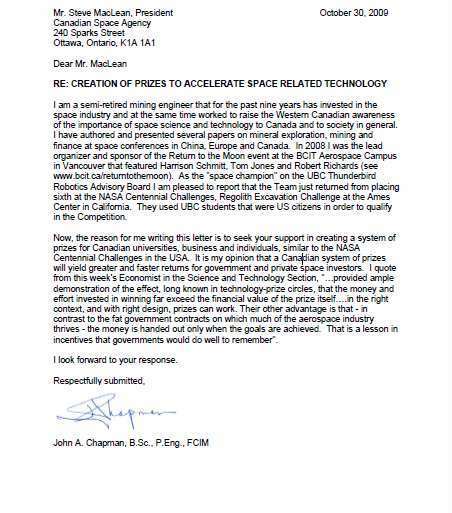 Of course, nothing ever resulted from this correspondence, although Chapman had a hand in the subsequent development of the Canadian Satellite Design Challenge, a Canada-wide competition for teams of university students to design and build a small low-cost satellite, and this contest is currently sponsored by the CSA. 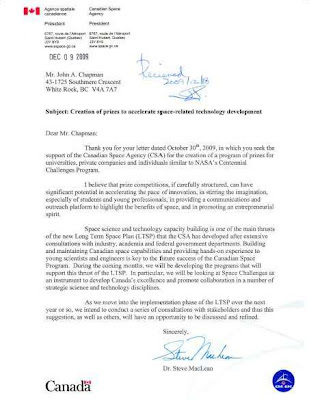 But the creation of a series of national contests and prizes similar to the NASA Centennial Challenges program in order to accelerate Canadian space related technology development is a good idea and should be revisited by the Federal Review of Aerospace and Space Programs and Policies, announced in February 2012 and currently collecting information for presentation to the Industry Minister sometime before the end of the year. Most of the documentation on this proposal may already be collected and organized, even if those documents are deeply hidden inside the Industry Canada office files containing CSA proposals which are never, ever supposed to see the light of day. BC based MacDonald Dettwiler (MDA), acting in its capacity as prime contractor for RADARSAT Constellation (RCM), is slowly ratcheting up the tone and tenor of public statements regarding a perceived lack of promised Federal government funding for the program. As outlined in the March 4th, 2010 Spaceref.ca article "RADARSAT Constellation Mission gets Funding in Budget," the original government plan was to provide a total of $497 million over five years in order to finish the RCM design work and then move forward with satellite construction. According to the article, the bulk of the spending was expected to occur "after 2011-2012." But MDA, which has also announced recent layoffs in its Brampton, Ontario robotics factory due to the winding down of the US space shuttle program (as per my March 3rd, 2011 post "Downsizing Announced at MDA Robotics") and the inability of the MDA on-orbit satellite servicing program to gain any sales traction in the US (as outlined in my January 15th, 2012 post "MDA Satellite Servicing Agreement with Intelsat Expires. "), is legitimately worried that the promised Federal government money will only arrive slowly and in amounts insufficient to support the program. The latest volley in this ongoing, public war of the words is the May 11th Vancouver Sun article "Richmond-based MDA may lose 150 employees if satellite project doesn’t continue" which quotes MDA communications manager Wendy Keyser as stating that "the company’s Brampton (Ontario) operation ... expects to lose another 50 (employees) in 2012 as a result of the cuts to funding in the space robotics area.” According to Keyser, “the company could lose approximately 100 employees in its Richmond and Montreal operations if RCM does not continue." Industry Minister Christian Paradis and MP Marc Garneau on May 9th. The minister is "committed to the Radarsat project and we are working on delivering in a cost-effective way." According to the May 10th, 2012 Spaceref.ca article "RADARSAT Constellation Mission Future and Canadian Space Agency Budget Get MP's Brief Attention" the build phase ("phase D") of the RCM was originally scheduled to go ahead in September 2012, "however, the recently released budget made no mention of RCM and available documents by the CSA do not specify a dollar amount to be spent in the 2012-2013 budget." So while the deal is officially still moving forward, the paperwork certainly isn't complete and the lack of a formally funded budget allocation in the current fiscal year gives MDA executives a reasonable cause for concern. In essence, no matter what the Federal government might say publicly, RCM is not a done deal until the terms and conditions of the final contract are complete. According to the May 10th, 2012 Globe and Mail article "No funding, no liftoff for Radarsat program, CEO says," the Federal government department responsible for allocating the RCM construction contract (Industry Canada, according to the article and not the CSA) remains "committed to the RADARSAT project." This is likely the core for the March 30th, 2012 MDA release titled "RADARSAT Constellation Mission update" which started the PR war with a public statement that MDA "has concluded that the budget does not include the funds required to continue the RADARSAT Constellation Mission (RCM) as currently envisioned." The MDA concern also likely relates to the April 30th, 2012 Ottawa Citizen article "Costs jump for Canadian Arctic satellite surveillance system: documents" which reports on Department of National Defense (DND) documents indicating that RCM, originally estimated at $600 million CDN, is now likely to cost over $1 billion CDN to complete. So not only is the contract not complete, but the cost to complete the contract has substantially increased, which is likely to complicate any future negotiations. The next few months are expected to be critical for the program. Why Not Build Planetary Resources a NEOSSat? The mass media, in their rush to judgment over the current financial state of the Canadian Space Agency (CSA) and the ongoing confusion over recent proposals from the billionaire backed Planetary Resources (PR) to mine the asteroids, seems to have completely forgotten how very well positioned Canada is to take advantage of this new entrepreneurial environment. First of all, we already have what is arguably the best tax code in the world for terrestrial mining operations. As outlined in my June 20th, 2010 post "Mining as a Model for the Commercial Space Industry" it would take only a very few legislative changes plus the reassessment of only one international treaty (the 1967 Outer Space Treaty, as per my April 7th, 2012 post "Do Current Laws Support Private Space Activities?") to make Canada the best place in the world to set up a "space" mining company. The proposed LEO space telescope. But Canada also has at least two examples of the technology required for the proposed Arkyd 101, or Leo Space telescope, which PR promotes as being the core of its "phase-1" plan to first inventory and then mine near Earth asteroids for water and various metals. Those two examples are the Microvariability and Oscillations of STars (MOST) space telescope and the Near Earth Object Surveillance Satellite (NEOSSat). MOST principal investigator Jaymie Matthews. 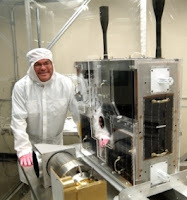 According to the May 6th, 2012 post on the HobbySpace website titled "Planetary Resources Arkyd 101 - not the first smallsat asteroid finder" the Canadian MOST micro-satellite (which has been in orbit since 2003) also uses a small telescope for stellar photometry. Although it uses only a 15-cm aperture for its telescope, the MOST is able (through the use of four reaction wheels, devices which aim a spacecraft in different directions without firing rockets or jets) to achieve a pointing error of less than one arc-second, which is the level of accuracy listed as being required for the LEO space telescope to effectively search for near Earth asteroids. Of course, MOST is designed to monitor variations in star light and doesn't officially look for asteroids. ... it will circle the globe every 100 minutes (when launched in the fall of 2012), scanning space near the Sun to pinpoint asteroids that may someday pass near our planet. NEOSSat will also sweep the skies in search of satellites and space debris as part of Canada’s commitment to keeping orbital space safe for everyone. NEOSSat applies key technology already demonstrated in Canada’s very successful MOST satellite. A model of NEOSSat, from the 2011 IAA Planetary Defense Conference. This sounds a lot like what PR is planning to do. The development of a star-tracker that has accuracy at the arc-second level. This level of accuracy is hard to achieve, requiring a narrow field of view for the star tracker, which is rather narrower than that used in most commercially available star trackers. What we decided on for MOST was to use the same set of optics for the star tracker and for the satellite's science instrument (in essence, putting two CCDs at the focal plane of the optics). This trick (which the Hubble Space Telescope also uses) allowed us to not have to carry a second set of optics (which are large, heavy and expensive), and also avoided the need to keep two sets of optics co-aligned to arc-second level (which is a very difficult thing to accomplish). Each CCD on MOST has a 0.86 degree field of view (3070 arc/sec), each having 1024x1024 pixels, so that each pixel sees a 3 arc/sec x 3 arc/sec patch of sky. We use made the image slightly out of focus, smearing the star images over several pixels, which enables us to do "sub-pixel interpolation" in order to measure star centroids down to better than 3 arc/sec --- I think that with software upgrades over the years, the guys eventually got the measurement accuracy down to 0.5-1 arc/sec. Larger reaction wheels had existed for many years before MOST, but we couldn't afford the mass or volume they'd need, and also they were pretty darn expensive, given our budget. Instead, we developed a new reaction wheel design, meant not only for MOST but as a commercial product. It was designed to be small, low-mass and low-cost. Also, it was designed to have a very low power consumption (to avoid driving up the cost of the power subsystem since photovoltaic cells are also pretty expensive), and to have a really very good speed/torque controller built into it, to minimize the errors between the torque we were commanding the actual torque delivered (too much torque jitter would have resulted in too-large errors in MOST's line of sight). While there are a number of current suppliers of similar reaction wheels on the market today, the star tracker system is still a unique Canadian innovation and only really available here. Someone should call up PR co-founder Eric Anderson and tell him about this. We could end up building him a NEOSSat. Canadians Building & Launching Rockets: Just Not in Canada! Rocket science is pretty straightforward, at least according to Will Durocher, the program manager and chief engineer of the Waterloo Rocketry Team. The hard part is the fund raising needed to pay for the rocket. According to Durocher, "it costs $6000 or more to arrange for the transportation and purchase the equipment you need in order to compete effectively at an international rocketry competition and while we currently have sponsorship from Bombardier, Pratt & Whitney Canada plus quite a number of other organizations, we're still a bit short of our financial goal." Durocher and his Canadian team of 20 graduate and undergraduate students from the University of Waterloo are expected to compete in the upcoming Intercollegiate Rocketry Engineering Competition, organized by the US based Experimental Sounding Rocket Association (ESRA), which will be held in Green River, Utah from June 21st -23rd. Assuming, of course, that the Waterloo based team can raise enough money. Teams from the Ecole Polytechnique de Montreal and a dozen other universities from the US and around the world are also competing. Of course, the official goal of the ESRA rocket competition is to launch to 10,000 feet and then recover a rocket with a 10-lb payload for the basic category and the same sized payload to 25,000 feet above ground level for the advanced category. The Waterloo Rocketry Team expects to compete in both categories. As well, a secondary intent of the competition is to encourage student design and construction of as many rocket parts as possible. These could be components related to propulsion, avionics, recovery, payloads or some other area. ESRA doesn't prohibit commercial components as part of their contestants entries, but extra recognition is provided for student-designed and built hardware. To compete in this second area of innovative design, Durocher and his team have built their "Eridani Rocket" with a liquid engine burning high pressure propane and nitrous oxide which they expect to produce 1500 pounds of thrust. The rocket also includes a "thrust vector control system" for directional control and a payload capsule containing a tractor escape system, able to fire at apogee to separate the capsule from the rocket and a second time to slow the capsule for landing. This rocket is expected to reach 25,000 feet to compete in the advanced category. A second rocket (designated as the "Venture Rocket") will have a hybrid engine burning a mixture of aluminised rubber and paraffin. It will also carry a scientific payload to test the marangoni effect and is expected to reach 10,000 feet to compete in the basic category. These two custom designs are likely a bit more expensive than the typical rocket being entered into the competition but Durocher and his team are likely hoping that the end result is also a bit more competitive. Anyone looking to help the team out with sponsorship or funding, can e-mail uwrocketry@gmail.com for more information. 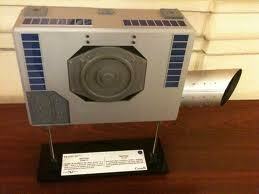 Media Reports: CSA "Lost in Space," RADARSAT "Over Budget" & UrtheCast "Hyped Vaporware." Just when you thought the Canadian space systems industry was patiently settling back for the inevitable public hand-off of submitted aerospace review documents to the Federal industry minister (expected sometime before the end of this year as per my February 28th, 2012 post "Aerospace (and Space) Policy Review Head Announced"), along comes multiple reports illustrating growing public concern over eroding Canadian capabilities and rising costs. 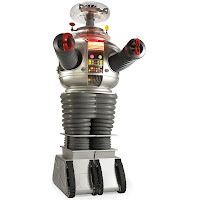 The first is the April 30th, 2012 Postmedia News article "Canadian businesses lost in space" which reports on "an absence of clear direction" for any Canadian "whose business lies in space" which makes them "uncertain where to focus" and wondering what to design. In the 1980s and 1990s the Canadian Space Agency (CSA) wrote three successive long-term plans to chart our course. These steered us through the glory years of building Canadarms and other robotics, launching two Radarsat satellites and helping build the International Space Station (ISS). Since Canada is a smaller player than NASA or other giants, these plans concentrated on doing a few things really well. But there's been no new plan since before the millennium. The article fails to mention the overall industry growth during this period (as described in my April 9th, 2012 post "Global Space Industry Grows 41% Over Five Years") or note that the $350 million CDN annual CSA budget can reasonably be expected to have only a small effect on the far larger $3.4 billion CDN generated annually by the Canadian space systems industry. It even forgets to note that the CSA is generally not the largest client for most of these companies and therefore has only limited input into what gets built (and even expressly suggests otherwise). But it does hit the proper overall note of concern and confusion. And it's not the only recent article doing so. RADARSAT Constellation timeline in 2004. In March 2006, CSA finally awarded the phase A contract (for conceptual design and mission definition) to MDA. Chart c/o eoPortal Directory and CSA. The second example is the April 30th, 2012 Ottawa Citizen article "Costs jump for Canadian arctic satellite surveillance system: documents," which reports on documents obtained under Canada's Access to Information Act, indicating that costs for the current RADARSAT Constellation (RCM) family of three synthetic aperture radar (SAR) satellites have risen from $600 million CDN to $1 billion CDN. The article goes on to state that the RCM program (originally envisioned as a follow-on to the highly successful RADARSAT 1 & 2) is not currently funded past August 2012, when the preliminary design (or phase B) is scheduled for completion. The satellites are now expected to launch in 2016 and 2017 according to the RCM project status website, but that could certainly change, just as it has multiple times before (the Ottawa Citizen article lists the launch date as being in 2014). In March, RCM prime contractor MacDonald Dettwiler (MDA) went so far as to issue a public press release (the March 30th, 2012 release titled "RADARSAT Constellation Mission update") which stated that the company "has concluded that the budget does not include the funds required to continue the RADARSAT Constellation Mission (RCM) as currently envisioned. At this time MDA is uncertain on the way forward on Phase D of RCM and expects to work with its customer to seek clarification over the coming weeks." As outlined in my May 23rd, 2011 post "Nothing to See Here! Move Along Now!" the RCM program has a history of lengthening lead times which normally drives up the total costs of a project as teams break apart, reform, attempt to justify themselves or move on to other things and generally kill time between funding infusions. This seems to be just the way the industry works and perhaps some of this confusion will be cleared up over the next few weeks. The flight model of the medium resolution RAL Cam 3, scheduled to be installed on the International Space Station (ISS) by Canadian company UrtheCast. But it's the final article which is a bit of a surprise, given it's source and genesis. According to the April 30th, 2012 SpaceRef Interactive article "UrtheCast's HD Video From Space Station: Real Product or Hyped Vaporware," a Canadian company "claiming" to place the first live HD video feed on the ISS, may not have a real product capable of following through on the promises the company has made. The article cites a variety of concerns including questions about whether there is actually an agreement in place to launch the camera to the ISS and questions regarding the technical capabilities of the HD video camera's as described in the company literature. 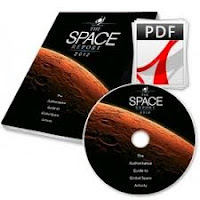 SpaceRef Interactive and author Keith Cowing have a reputation for competence plus a decade and more of experience covering the space industry, so it's unlikely that they'd publish something like this without suitable documentation to back up their claims. It will be interesting to see how BC based UrtheCast responds to the charges. But it's another example of multiple reports illustrating a rising public concern over eroding Canadian capabilities and increasing costs which have come to light in only the last few days.